Computability, Complexity, and Languages: Fundamentals of Theoretical Computer Science provides an introduction to the various aspects of theoretical computer science. 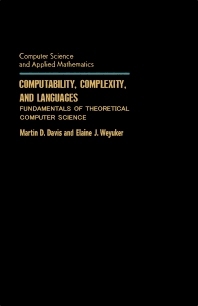 Theoretical computer science is the mathematical study of models of computation. This text is composed of five parts encompassing 17 chapters, and begins with an introduction to the use of proofs in mathematics and the development of computability theory in the context of an extremely simple abstract programming language. The succeeding parts demonstrate the performance of abstract programming language using a macro expansion technique, along with presentations of the regular and context-free languages. Other parts deal with the aspects of logic that are important for computer science and the important theory of computational complexity, as well as the theory of NP-completeness. The closing part introduces the advanced recursion and polynomial-time computability theories, including the priority constructions for recursively enumerable Turing degrees. This book is intended primarily for undergraduate and graduate mathematics students.